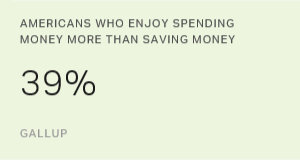 WASHINGTON, D.C. -- Americans are more upbeat about their personal finances today than at any time in the past 10 years, with 49% saying they are financially better off than they were a year ago. This is up from the 44% who felt financially better off at the same time last year and from a low of 23% in 2009, more than a year into the Great Recession. Twenty-eight percent report they are financially worse off than a year ago, while 22% say their situation is the same. These data are from a Gallup survey conducted Jan. 4-8, before the inauguration of President Donald Trump. The last time this many Americans felt financially better off was in January 2007 (50%). While the current percentage saying they are better off still isn't at the majority level, it is relatively high compared with most measurements in Gallup's 41-year trend. Throughout the 1970s and early 1980s, fewer than four in 10 said they were better off, with many measurements during that period falling into the 25% to 29% range. The figure was generally higher from the mid-1980s to the mid-2000s, mostly fluctuating between the low 30s and high 50s. The rises and dips within that period tended to correlate with economic recessions and recoveries in the U.S. An extended low period occurred from 1990 to 1992, during a recession, while the high point on this trend occurred in 1999, when 58% said they were better off than a year ago. From mid-2008 to early 2012, during and immediately after the Great Recession, fewer than three in 10 Americans said they were better off, while many more said they were worse off. In May 2012, these assessments started becoming more positive. A second question asks Americans whether they will be financially better or worse off one year from now. 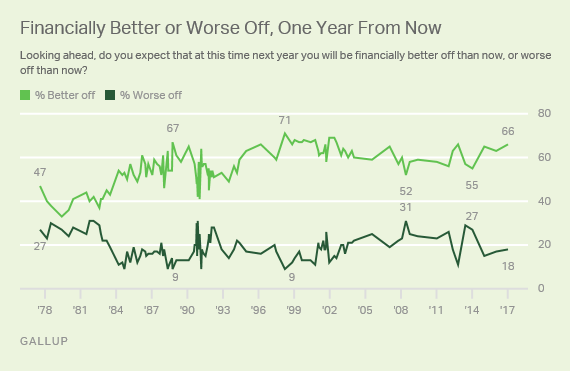 Across Gallup's four decades of measurement, more Americans have consistently predicted they would be better off than worse off, although to varying degrees. Currently, 66% of Americans expect to be financially better off a year from now. That is similar to each of the past two years, but it is an improvement over 2013-2014 when it slipped into the mid-50s -- as well as during the 2007-2009 recession, and from 1991 to early 1994. Americans were the least optimistic about their future finances in the late 1970s and early 1980s, a time of high inflation, when about four in 10 expected to be better off in a year's time. The peak for this question was in 1998 -- 71% -- during the economically high-flying days of President Bill Clinton's second term. 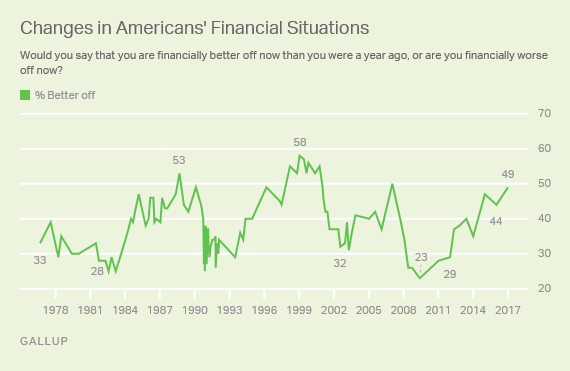 Americans' perceptions of being financially better off than a year ago have bounced back strongly from the recession and post-recession years. At the same time, they are maintaining a positive outlook about their finances improving in the coming year. 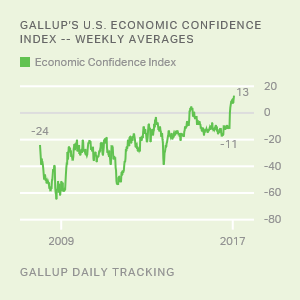 This broad optimism aligns with a growing economic confidence in the U.S., which has only inched higher with the inauguration of President Trump. These views about being better off now and in the future are reflected in other signs of progress in the U.S. economy, such as the unemployment rate, which has declined in recent years. Wage growth in the U.S. hit a seven-year high in 2016, which may have boosted Americans' perceptions of being better off than a year ago. Americans' continued confidence in their finances hinges on the strength of the economy and on their own wages or other income keeping pace with inflation, especially as the Federal Reserve looks to raise interest rates in 2017. Prior to Donald Trump's inauguration as president, Americans were sharply divided over whether the nation will be better or worse off four years from now.